“I am not an economist. 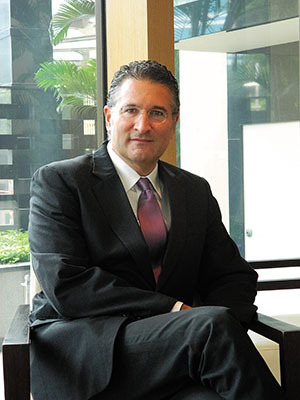 I am an old bond trader,” said Drew Brick, who leads the Market Strategy desk for RBS in the Asia-Pacific region, when Forbes India caught up with him for breakfast on a recent visit to India. “We trade the noise,” he added emphatically. Right now, the noise is about what US Fed Chairman Ben Bernanke said or didn’t say about his bond-buying. And this is why one needed to know what the “old bond trader” had to say about why the rupee was falling against the dollar. “What is happening now is really not a function of anything really specific to India, although India has an inclination to have problems,” explained Brick. Finance Minister P Chidambaram should welcome at least the first part of his statement, since he has been defending the “fundamentals” of the economy to anybody who would listen. The foreign exchange market hasn’t been one of them, for it has been cocking a more attentive ear to what Bernanke had to say. And on June 19, he said that the Fed would go slow on its money printing operations in the days to come as the US economy started reviving. “If the incoming data are broadly consistent with this forecast...it would be appropriate to moderate the monthly pace of purchases later this year...And if the subsequent data remain broadly aligned with our current expectations for the economy, we would continue to reduce the pace of purchases in measured steps through the first half of next year, ending purchases around mid-year,” Bernanke said at a press conference that followed the meeting of the Federal Open Market Committee (FOMC). Brick, who bears a striking resemblance to Hollywood actor Richard Gere, had worked with BNP Paribas, Morgan Stanley and legendary bond kings Pimco before he joined RBS last year. He explained why the dollar is holding up even though US growth isn’t exactly something to write home about. “Some people think that the United States is the least dirty shirt in the drawer. And it has got growth, though not a very high trajectory of growth,” said Brick. It is this minor revival that is creating problems for carry trade investors who have borrowed and invested money across the world on the assumption that US interest rates will rule close to zero in the foreseeable future. The return of economic growth in the US has pushed up 10-year treasury bond yields. The yield, which stood at 1.63 percent in the beginning of May, has since risen to 2.5-2.6 percent. And what do we get if we apply this formula to calculate the yield on 10-year US treasuries? Explained Brick: “If the 10-year yield today is around 2.2 percent [it was so, on the day the interview was conducted], what would you say the US nominal growth is? Around 2 percent. What do you think inflation is? Around 1 percent. What do you think the risk premium is in the market place? Clearly it’s risen a little, so maybe it is 30 basis points.” (100 basis points make 1 percent). This gives us a 3.3 percent yield on 10-year US treasuries. “And when the 10-year treasury is trading at a yield of 2.2 percent, what do you do as a trader? You sell that freakin’ thing. And that’s the risk,” said Brick. When lots of bonds are sold at the same time, the price of the bond falls and thus the yield, or the return, goes up. And that is precisely what has been happening with 10-year US treasuries, with the yield shooting up by nearly 60 basis points from 1.63 percent in early May to nearly 2.2 percent on June 18, 2013. After Bernanke’s press conference on June 19, the yield shot up dramatically. On June 24, it stood at nearly 2.6 percent. “The 10-year US treasury is extremely important,” said Brick. This is because it sets the benchmark for interest rates on all other kinds of loans in the United States, from interest rates charged by banks on home loans and home equity loans to interest at which carry trade investors can borrow money. 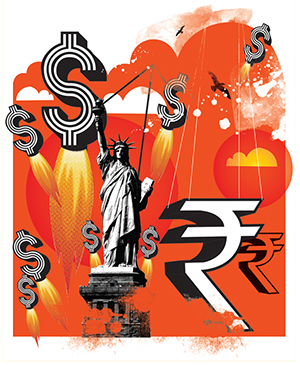 More important for the rupee’s health, when the 10-year US treasury yield goes up, carry trades become less attractive. “The days of quantitative easing-sponsored carry trading are about to be pared, perhaps significantly. Remember, as volume rises, the cost of carry rises and so, too, does market illiquidity,” said Brick. This is why investors have been selling a lot of the assets they have invested in and repatriating the money back to the United States. The Indian debt market has been hit by this selling and foreign institutional investors (FIIs) have pulled out nearly $5 billion since late May. In fact, stock markets all over the world also fell in the aftermath of Bernanke announcing that he will go slow with his money printing operations in the days to come. The Federal Reserve has been printing $85 billion every month. It uses $40 billion to buy mortgage-backed securities, and $45 billion to buy long-term American government bonds. By doing so, it has been pumping money into the financial system and keeping interest rates low in order to spur growth. Bernanke did not say he was going to withdraw all kinds of quantitative easing, or even that he would start withdrawing the easy money. That would require him to sell all the bonds he bought. The market though is getting ready for that to happen. “The market is already trading this. Forward pricing in the markets is already adjusting for this,” said Brick. Low interest rates in the US after the 2008 Lehman crisis led Asians to borrow a lot in cheap dollars. “All across Asia, non-financial corporations, and even households to a small extent, have been taking out huge amounts of dollar funding,” said Brick. And this may cause some major problems in the days to come. “Right now we are seeing an unwinding of the dollar carry trade but at some point the dollar is going to turn and then the servicing cost of that debt is going to be all the more tricky. Every crisis that I have ever read through, and I am an old man, has always been born on the back of rising rate cycles that move higher with the dollar in tow. This makes the financing cost of debt in emerging markets more expensive. That’s across the board. That’s probably true here in India as well,” he added. If the rupee gets to 65 to a dollar, our oil bill will go for a toss. And will gold have a rally in rupee terms, assuming that its price stays stable in dollar terms? “Gold is a zero interest, infinite maturity, inflation-linked bond. That’s all gold is,” Brick responded. The supposed end of quantitative easing in the United States has taken some sheen off the yellow metal. “But it’s possible that we may have another move higher. The selloff has been rather pronounced. But it’s not the core issue here. Gold is a symptom of the larger issue,” said Brick. Brick also feels that the bond market in the United States might be getting a little ahead of itself. The broader point is that if yields rise at a fast pace, they will push up interest rates on loans. This will slow down some of the economic growth that seems to be returning to the United States. And that situation may not be allowed to play out. So where does that leave Asia? “If quantitative easing gets tapered off as a consequence of relatively strong growth, then quite frankly Asian equities probably will hold in pretty well,” explained Brick. “What is another scenario? I can give you millions of scenarios. But the truth is we don’t know in the opening stages, the first minutes of a three-hour movie, how it is going to play out. It’s going to be like a Bergman movie. I don’t know how it is going to play out but it is going to be weird at times,” Brick said. Weird it will be, for “even the end-point of tapering [of Fed bond purchases] leaves the Federal Reserve with a still-gargantuan 25 percent-of-US-GDP balance-sheet. Pressures will sustain, even with reprieves,” Brick concluded.